One of the most infectious and upbeat singles in the Motown catalog is unique in two ways. First, it was not written by main Miracle Smokey Robinson, but by the hot house songwriting team of Holland-Dozier-Holland. Second, it is one of few Motown songs to appropriate the Bo Diddley beat. As Robinson’s voice joyously soars over the Funk Brothers groove, the Miracles, Martha and the Vandellas and members of the Supremes, Temptations and Marvellettes chip in on backing vocals. The HDH production team did a great job of capturing a live sound that, like “Do You Love Me,” sounds like it was beamed directly from the greatest party in the world. Robinson’s multi-octave range is a marvel, but honestly anything over that groove would have been a hit. 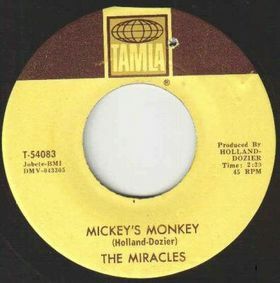 “Mickey’s Monkey” was one of the Miracles biggest hits. Unsurprisingly, Berry Gordy tried to bottle lightning a second time by having Martha and the Vandellas cut a version, but neither their cover nor subsequent readings by The Rascals, The Hollies or John Cougar Mellencamp made an impact.